The Skycloud is the award-winning multifucntion pen (compatible with herb, wax and e-juice) from KandyPens. As vaping continues to become mroe and more popular, we’re seeing an increased demand for vape pens with increased versatility. We’ve heard a lot of really great things about this unit, so let’s check it out and see how it performs. The Skycloud by KandyPens is a multifunctional vaporizer that can be operated with e-liquid, dry herb and concentrates. 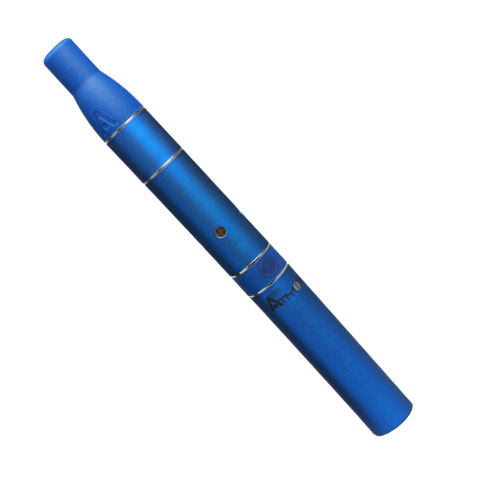 Similar to a lot of the vape pens that are currently available it has the same “flat oval” style battery and attachments. 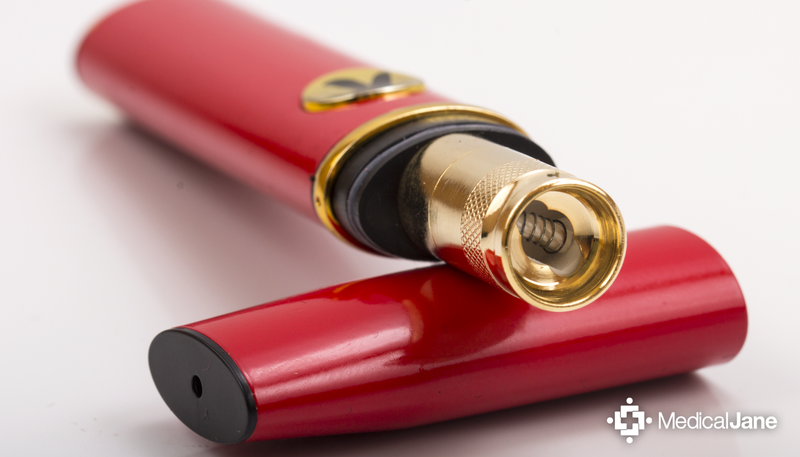 This design fits more comfortably into your pocket than a circular battery that is more reminiscent of an actual pen. The top of the battery contains two small connection points that create electrical flow between all of the atomizer attachments, which can easily be popped on/off for quick swaps.Then five quick presses of the button will lock the unit to prevent it from accidentally heating up when in one’s pocket or purse. The Skycloud is available in a range of bright colors that include; black, chrome, gold, hot pink and white. 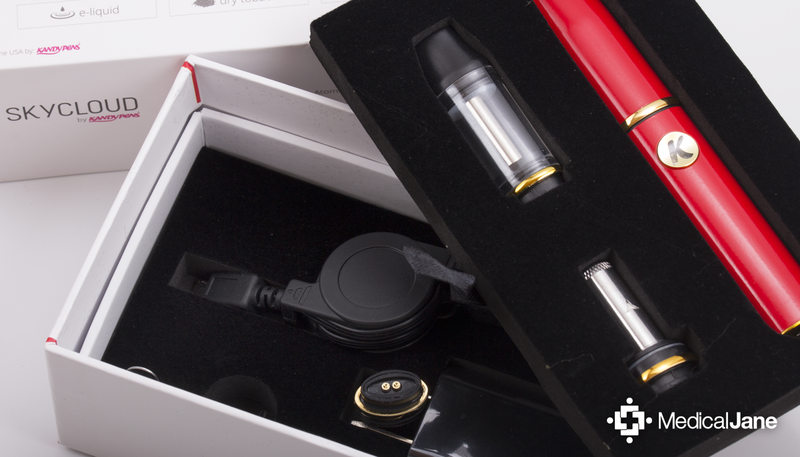 In the box you will find everything necessary for whatever style of vaporization you prefer. The clear tank with a heating chamber in the center is used with e-juice, which is a great component for those who are trying to quit smoking. The gold colored chamber is designed for use with waxy concentrates and is unique to a lot of atomizers, as it features a threaded top that acts as a cover to prevent any splatter. The third attachment is for use with dry herbs and also utilizes a top that screws on to avoid anything from being sucked through. What’s really nice about this set is that all of the attachments easily pop right onto the battery. That way you have all of the versatility without needing to carry around a pocket full of different vape pens. Some accessories come included as well, such as a dab tool and cleaning brush. These pieces making loading and cleaning the Skycloud incredibly easy. This is one of the more functional pen style vapes that is currently available and there are a lot of them these days! The e-juice tank is very easy to fill and does not leak back out. The wax chamber is a very nice design with the screw on top, as most atomizers lack this and can allow the concentrate to splatter on the inside of the mouthpiece. This little feature saves time by avoiding any unnecessary cleaning. The dry herb chamber is very similar to the other small heating coil designs; however it fits sleekly a top of an atomizer base. All of the attachments have the same connection and flawlessly attach to the battery, great for those who don’t wish to transport multiple vaporizers. HOW WELL DOES THE HERB CHAMBER WORK? 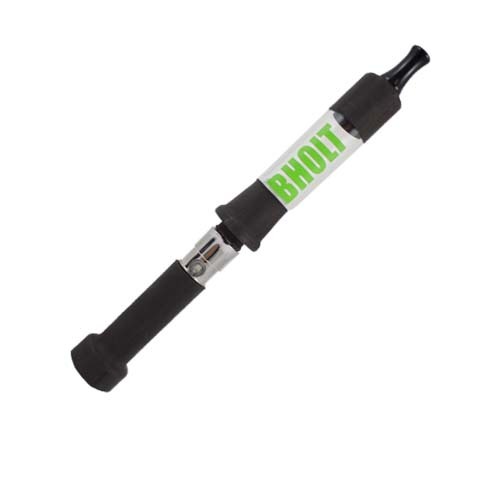 Honestly, there is no dry herb chamber for a vape pen that does not end up combusting the dry material at least somewhat. Though there is obviously still room for improvement, there are some techniques that help to make operation more efficient. It starts with the grind of the herb being used; the best method is to leave it kind of coarse. Gently place the slightly ground herb into the chamber. Preheat the vape by holding the button for 7 to 10 seconds, then let go. Pause momentarily before holding the button back down. Every 3 to 4 seconds, take a quick draw or sip of vapor. Stir the loose leaf material after a few draws and this will assist in preventing the herb from overheating in one section, which leads to it burning. The manufacturer of the SkyCloud is very confident in the product that they have created and as a result offer a full Lifetime warranty. Now that can be slightly deceiving as the most common thing to go out on one of the pen style units are the atomizers, so are those covered? They are not. The lifetime warranty exclusively protects you if there are any defects due to technical dysfunction of the battery. Though you will still have to purchase atomizers as they burn out, there is peace of mind knowing that the battery is covered for life. It’s hard to find a warranty that covers a pen battery for more than a few months, let alone an entire lifetime! The Skycloud is certainly a step up from a lot of the vaporizer pens that are available these days. The ability to efficiently switch between any style of vaporization for less than $100 is a phenomenal value. No need to drop any extra cash on additional accessories, because it all comes standard in the box. Each attachment can be swapped off of the battery with ease and you can quickly go from e-juice to concentrates and then vape a little herb. Press the button five times and the battery is locked, ready for transporting. The Lifetime warranty on the battery is a big selling point, because these batteries are notorious for short lifespans. Even if you only intend to use it for one of the three options, having such a lengthy warranty will save some money in the long run. The battery is very quick to charge up to, you will have a full battery within 1 hour through the wall charger and 2 to 3 via a computer. The charge will then last easily over the course of a full day of use. Snag a Skycloud today and you will never have to think about purchasing another battery in your life! You can buy a SkyCloud Vaporizer at our trusted vaporizer retail store, where we purchased ours. The Skycloud is a high quality multifunctional vaporizer pen that works best with waxy concentrates or e-juice. 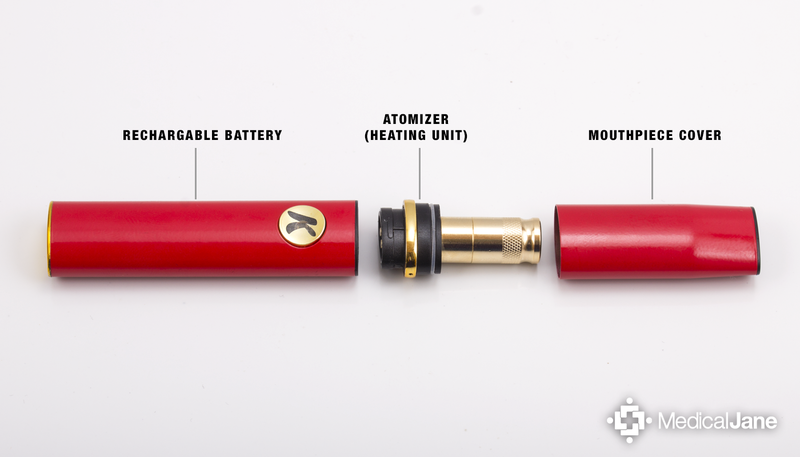 The atomizers seem to last longer than others that are available and the battery itself features a rather sweet Lifetime warranty.